Greetings, I am a new member and this is my first post here. I have been trying to find info on the type of first aid kits that would have been mounted/carried in L-Birds during WWII. I would assume it would be the standard "Kit, First Aid Aeronautic". The only reference I have found so far has been to a pocket sewn into the upholstry of one of the seat cushions in the L-4 for the "First Aid Kit". Was there a different kit designed for the Grasshoppers or did they also use the standard bulkhead mounted kit? The stinson L-5 used the standard Kit, First Aid Aeronautic. It was Lift-a-dot attached to the door. There were two different variations, however. The earlier model kits had a second buttoned flap in the front of the kit, while to more common later kit had a bottoned flap on the left hand side of the kit. I have seen both versions that you mention but didn't know the front flap pre-dated the side flap type. Do you know when the side flap versions entered common usage? I also would like to know if the Dark OD#7 kits with the painted red cross and medical corps caduceus between the US is late war or purely post war. As far as I know, OD kits (canvas, not synthetic) with red crosses were post war. However, I have a WWII kit with the red cross and white background hand painted on it in the field. I'm not that knowledgeable on the L-4, but if you are looking for a low-price authentic kit, I'd go with the khaki canvas 'Kit, First Aid Aeronautic'. They are common on ebay and generally are pretty fairly priced. If I remember correctly I got mine from a guy in italy that has been selling NOS kit cases (no contents) on ebay. I can't remember his name though. For more information about period kits, there is a great article in the Sentinel Owners and Pilots Assoc. (SOPA) newsletter. I hope that helps. Good luck with the project! If you are going to be at OSH this year swing by and say hello. I actually just received a 'Kit First Aid Aeronautic' today from an Ebay purchase. It's a very clean example, worthy of installation in an aircraft I think. It also had a good amount of the original contents. I can't make it up to Oshkosh this year, I just burned a week's vacation at the beach with the wife and kids. Maybe next year though! The Piper L-4 used the "Johnson & Johnson first aid tin" identical to the J & J autokit. It fits in the seat pocket. 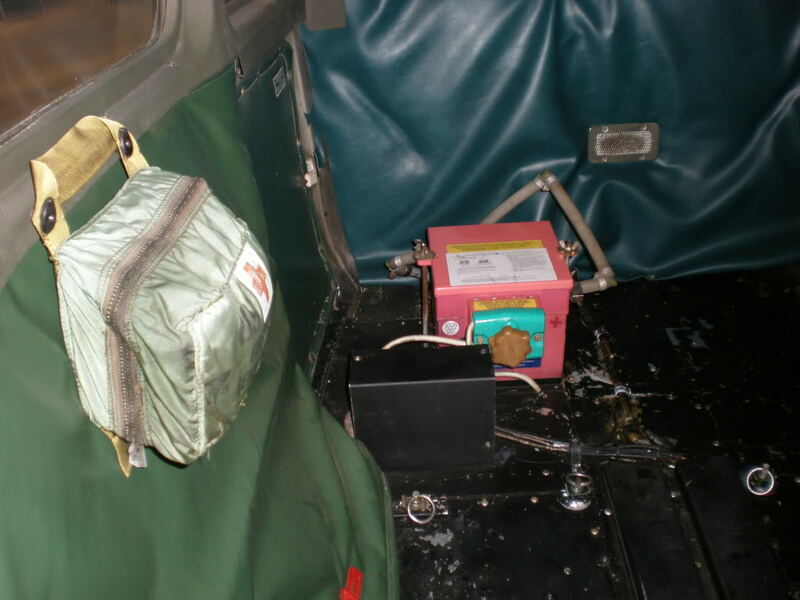 You can see the top of this tin in the L-4 AAF manual pictures of the rear seat. Talking to the veterans, they said they would ditch this kit from the back seat and store it in the overhead wing root area. The kit eventually went missing and was usually replaced with whatever first aid kit they could get their hands on in the field. I just received the AAF manuals on the L-4A/B and L-4J and saw the picture of the J & J first aid kit. I'm glad you posted the I.D. on the kit because I was trying to figure it out. Do you know if this kit was specific to the L-4 or also the L-2 and L-3 as well? Sorry Ron, not sure bout L-2, L-3 kits. That seems logical. Leave it to the GI to 'procure' and carry what is really practical and useful and ditch what isn't. Even if his job is flying an airplane. It's really interesting to see that the kit changed little between WWII and Viet Nam. Another thing to remember is that at least in the AGF, the artillery spotter pilots were all trained mechanics, too, so they could do pretty much whatever they wanted to on their birds....within reason anyway!